The last bit of rammed earth in my immediate future is the infill panel in the doorway. This one is a little bit more of a challenge technically, because I have to incorporate a steel lintel and build a form structure in the doorway upon which to ram the panel. This is a frame construction using 140x45 structural pine, supporting a heavily braced form ply sheet upon which I’ll ram the earth panel. 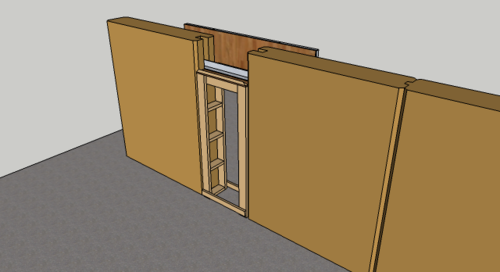 I’ll use my existing form panels, bolted through the frame and over the top of the existing wall.